We have no idea what we’re doing, but we’re doing it anyway. BTS of the first concept shoot for Fearless. Courtesy of Steven De La Roche/Warlords.Photo. Making any sort of film is an enormous undertaking. Summer of 2017 when my friend Steve and I dreamt up this idea sitting on his porch, we knew we were getting in over our heads, but we had no idea the ride we were in for. Be it a 5 minute profile spot, a short film, or the vast expanse of a feature film: making a film requires a commitment to weeks, months, or even years of writing, an all star cast and crew, and a great deal of labor and man hours. Beyond that already daunting task, what if you’re primarily self financing the venture? What happens if you have to self produce this project? Locations, actors, wrangling an ever growing list of people willing to help, and tasks you’re not remembering. Making a film is a hectic venture. 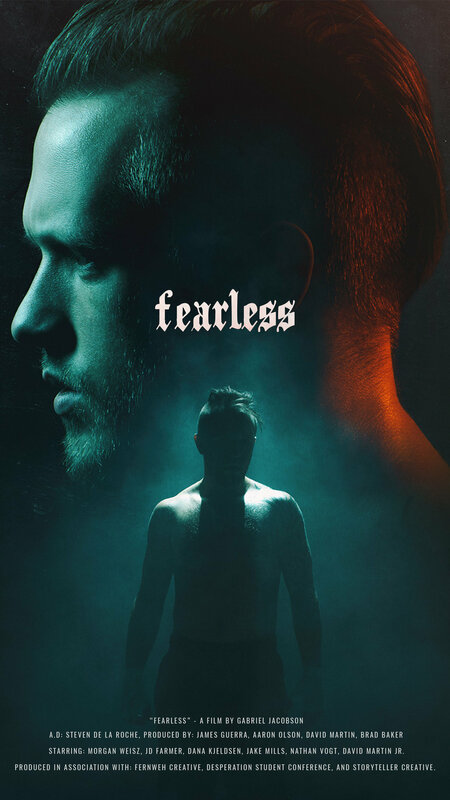 This project came about initially as we were brain storming content for Desperation Student Conference’s 2018 year “Fearless”. We started writing around a boxer character who was angry, afraid, and carrying a lot of ghosts with him. This character was an image of ourselves in a way. We were projecting things we’d never quite been able to verbalize, and this character became very important. We dove into the character and started shooting some concept footage for an early teaser. As we shot, the character began to make more and more sense and became a central part of everything we were writing. Eventually, sitting on that porch, we decided we had to explain this character more, and really tell his story. We decided to go to our bosses with a half baked boxing movie idea. We ended up getting a green light for this project with no script, a barely-there concept teaser, and no idea how to move forward. Early color test from the final fight scenes. Flabbergasted that anyone would trust us to make a film, Steve and I sat back down on that same porch. I’ve worked on a handful of movies in varying capacities. I wasn’t entirely ignorant to the process, or what this would take. But knowing what it takes to makes a film, and what it takes to make a presentable film are entirely different animals. I’ve never coached actors, I’ve never written a large script or had to figure out how to materialize that into scenes. As we sat there, we laughed and confessed we had no idea what the heck we are doing, but we’re going to give it our best shot. Director Gabriel Jacobson talking with actors Dana Kjeldsen and JD Farmer. Over the next months we dove headfirst into script writing. Days were spent watching youtube tutorials and film breakdowns, masterclasses from great writers, and endless lighting tests. We brought on a great actor who had written a number of scripts himself, Dana Kjeldsen. Dana became instrumental in the writing process, constantly trimming fat and unnecessary words. He was able to take ideas, and emotions and turn them into human beings. Dana had worked closely with our lead actor Morgan Weisz before, and was able to coach him and help him find his character. We were blown away by the results. It began to appear that we were actually scratching the surface of a real movie. 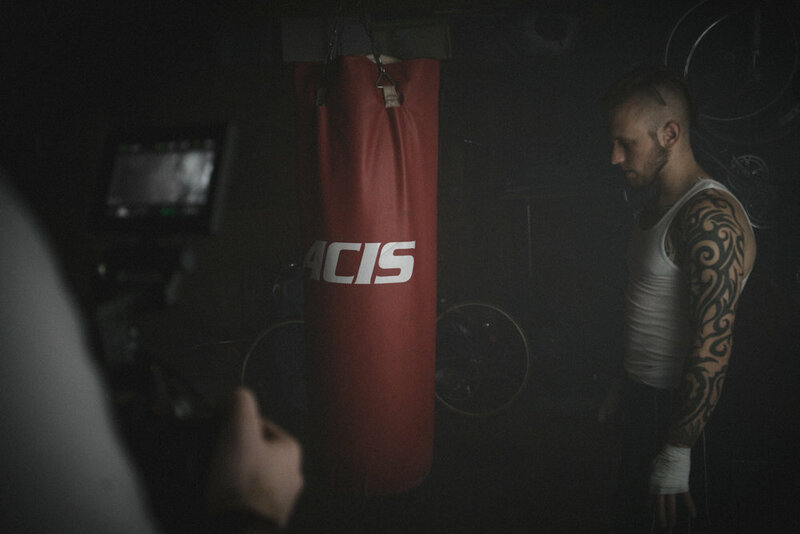 Shooting the final fight scenes. BTS courtesy of Zach Miles. Through discouragement, disorganized shoot days, locations falling through and missed deadlines, we kept moving forward. We believed in this character. We kept going back to why we wrote the story in the first place. We kept going back to that porch. Something inside us knew that this story had to be told. We had to build the “boxing ring” ourselves. We ended up never securing an actual boxing gym throughout the entire film (a boxing movie). Scenes were re-written, and some never got shot. But we made it, and it is good. It’s not perfect by any means, not even a little bit close. But as I reflect on my first whack at making a movie I look back at all the moments that made up this film, and the people who believed in this idea enough to go along for the ride. Photographer Aaron Anderson shooting the poster for Fearless. I would like to take time to thank Morgan Weisz, Steven De La Roche, JD Farmer, Dana Kjeldsen, Jarrod Gipson, Aaron Olson, David Martin, and James Guerra. I couldn’t have made this come to life without all of you believing in this project, believing in me, and believing that a ragtag team of creatives could pull this off. So with that, I present to you Storyteller’s first short film, “Fearless”. Movie poster created by the genius Aaron Anderson.